Last week was incredibly hard. Dr Maya Angelou died. I suppose I knew it was coming. And to be honest, it wasn’t a death I thought of with great dread, as I did whenever I contemplated President Nelson Mandela dying. Maya Angelou’s work and her story meant a great deal to me, but I didn’t expect the to feel the loss as keenly as I did. I didn’t think I’d be – in the same way I did when my aunt died – voraciously avoiding all mention of it on social media, and in erstwhile obituaries, because I do not really want to cry anymore. The week was already hard because it was the week the doctor called to tell me, apologetically, that our second attempt at IUI (which, for us, is really ICI – intracervical insemination – far less complicated, slightly more ridiculous odds to beat) was unsuccessful. So, I was already reeling when I wandered onto Facebook (as you do) and read that Maya Angelou was gone. And so here I am, once again, contemplating loss and pain and grief, and life. At some point during my contemplations, I became angry. I mean, spittingly, searingly, ridiculously so. At everyone, and everything, and nothing and no one in particular. I am angry at my doctor who can offer us no clear answers; I am angry at my body (and how) for not giving me this one thing I am asking for; I am angry at this baby, who is so loved and wanted, and who will not manifest; I am angry at myself for telling everyone about this whole experience and making myself and my husband vulnerable to other people’s reactions to our story; I am angry at other people for reacting or not reacting; I am angry at the people in my life who now treat me like so much reproductive kryptonite, like I cannot be around pregnant people and/or children (as if my struggles with getting pregnant are catching, or as if I will kidnap babies straight out of their mothers’ arms and/or bellies). I am just plain angry. Partly because it’s easier to be angry than it is to be heartbroken. But mostly because the anger is a part of the grief I feel for the narrative that could’ve been. At the recommendation of my doctor (who has, of late, been fielding increasingly frantic and frosty emails), we saw the resident psychologist at our fertility clinic. We waded through our story, taking her through our journeys, traumas and all, to each other, and our journey so far, together. “Wow,” she said, at one point, “It’s as if you want to say, what more can be thrown at you? Can’t something go your way?” Amen, sister. It should’ve been easier for us. It should’ve worked the first time around; I should’ve had my Mother’s Day, goddammit, I should have given my husband his Father’s Day. It should’ve been easier. Because you are human beings you are going to meet failure. You are going to meet disappointment, injustice, betrayal, and irreparable loss. You will find you’re weak where you thought yourself strong. You’ll work for possessions and then find they possess you. You will find yourself — as I know you already have — in dark places, alone, and afraid. What I hope for you, for all my sisters and daughters, brothers and sons, is that you will be able to live there, in the dark place. To live in the place that our rationalizing culture of success denies, calling it a place of exile, uninhabitable, foreign. When I was 8 years old, I had a friend named Jade. Jade lived next door to us, with her parents, and though I was slightly older and we went to different schools, we formed a fast bond that mostly revolved around our shared love of Barbie dolls. A year or so into our friendship, Jade had a birthday party to which she invited her school friends and little old me. “This is my friend Rumbi”, she told her white school friends. Then – in a stage whisper – she added, “Sorry she’s black.” The world being what it is, it was not my first or, by any measure, last encounter with this idea that by virtue of my race, I fell outside of the narratives of acceptable. However, it was the first time it was so blatantly put before me. What’s worse is, I knew that I had to stay at that party with hateful Jade and her friends, because if I kicked up a fuss and disagreed, I would prove every insinuation she made with the way she spat out the word black. I would be unacceptable, unsuccessful and probably worse. So I stayed. I believe that I stayed at that party all through my early childhood, right into my teens, when I started to become the woman I am now. I stayed at that party right until the moment I discovered the Maya Angelou’s poem Phenomenal Woman. When I was 14, my mother bought a subscription to the newly-launched South African edition of O, The Oprah Magazine. As part of her subscription, she received a complimentary CD of poetry celebrating women. 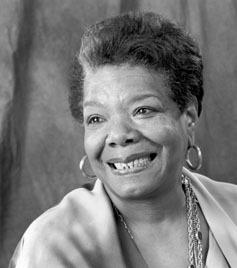 Maya Angelou’s Phenomenal Woman was included. In this poem, I found a mighty celebration of a black woman whose beauty does not fit inside the neat lines and definitions handed down by society. I sat in my room, memorising the words, letting them wash over me, until they were part of me, one with my black skin and my black soul. Maya Angelou, a woman whose story was nowhere near traditional mores of success bore her story with pride and told me, black girl, with hair and skin like hers, that I could do the same with my story, no matter what society said to me. So what I hope for you is that you live there not as prisoners, ashamed of being women, consenting captives of a psychopathic social system, but as natives. That you will be at home there, keep house there, be your own mistress, with a room of your own. That you will do your work there, whatever you’re good at, art or science or tech or running a company or sweeping under the beds, and when they tell you that it’s second-class work because a woman is doing it, I hope you tell them to go to hell and while they’re going to give you equal pay for equal time… And when you fail, and are defeated, and in pain, and in the dark, then I hope you will remember that darkness is your country, where you live, where no wars are fought and no wars are won, but where the future is. Our roots are in the dark; the earth is our country. So I sit with my ‘failure’, I sit with my story. It is not the narrative I wanted or hoped for. But it’s what I have. As I began to mourn the loss of Maya Angelou, I remembered that 14 year-old girl, hearing for the first time, the possibility that lay in reclaiming her story as part of her identity. I remember what it felt like to reimagine what I thought of as failings, as parts of myself, without which I could not be whole. The struggles towards parenthood are not different. They are presented to me as failures, with every apologetic doctor’s phone call, every negative pregnancy test (as a dear friend said to me “They shouldn’t call it a test, as if you’re failing at getting pregnant!”). I am reminded by Maya Angelou, by way of Ursula Le Guin, that those failures are my home, are the places in which I find myself. They are the parts of me that I cannot control, but that are nonetheless absorbed into myself. Am I ever more authentic than I am when I am living them? You may encounter many defeats, but you must not be defeated. In fact, it may be necessary to encounter the defeats, so you can know who you are.